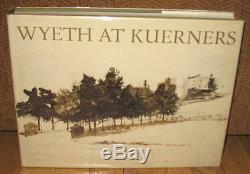 SIGNED by Andrew Wyeth on the half title page. SIGNED by Betsy James Wyeth also on the title page. Very good in a very good dust jacket. Wyeth at Kuerners is a book about the artist by his wife that contains 370 reproductions, 315 of which have never been reproduced before, and reveals a startlingly intimate view of Wyeth at work. In her introduction, Betsy Wyeth explains that her husband begins with scores of quick prestudies in pencil, dry brush and watercolor which he spreads on the floor and tacks on the walls of his studio when he is ready to start on a tempera painting. Many of these still bear the splash marks of raindrops, the paw prints of family dogs, the artist's footprints, and in one case added drawing by Wyeth's young son Jamie. She also points out that nearly all of Wyeth's work..
And soul it almost seems as well.. Has centered on only two locations: The Olson farm in Maine and the Kuerner farm in Pennsylvania. In presenting the material she lets us see not only how the artist works but allows us to share with him his deepest feelings about the place and the people who live there. Sequence after sequence of drawings grows dynamically toward the final painting. People, animals and objects appear and fade in an eerie way as the concept develops, and one gets a subtle understanding of why Andrew Wyeth's work is so charged with those unseen presences that create the compelling depths and tensions in his work. The boards have light wear. Hint of sunning to the bottom edge. The dust jacket has light wear. Soil spots to the edges. Few scratches and scuff marks. The item "SIGNED Andrew Wyeth SIGNED Betsy James Wyeth At Kuerners Farm Paintings HC DJ" is in sale since Tuesday, April 8, 2014. This item is in the category "Books\Antiquarian & Collectible".